Meet the Staff of Duanes Repair Inc.
Mr Lucky arrived around Thanksgiving of 2015 under the hood of a car. He was sent home with the cars owner only to return 3 days later under the hood of a different car from the same family. His responsibilities include mousing sleeping and eating all of which he is very good at. Him and Penny have a love-hate relationship. 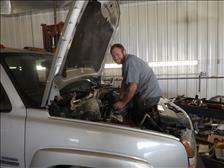 Duane's Repair, Inc. was founded by Duane Irlbeck in July 1986. It was originally located at the Corner Station southeast of town. It started as a one stall garage with an additional stall added about a year later. In 1993 Duane began looking for a new business site and with the help of the Templeton Area Development Corporation a business park was established, a lot was purchased, and a new building was constructed. Duane's Repair, Inc. moved in February of 1995. It housed a parts room, an upstairs storage area for tires, and four work stalls. In 2000 Duane became a used car dealer and began selling used cars. In 2001 an addition was constructed that added three more stalls. In 2002 Duane purchased the lot to the east of his buiding from the TADC and a 60ft X 100ft storage building was constructed. In 2011 another addition was added to the north side of the building for tools and equipment and an additional hoist was added. In 2016 another addition was added to the south of the storage building. It contains a drive over pit to do alignments on, an additional hoist, wash bay and more storage. As of August of 2016 Duane's Repair, Inc. employs 6 full time people. The company sells about one hundred vehicles a year and has a large customer base for its automotive service repair facility. Duane invites anyone to come and see why so many people return to us for sevice and sales time and time again. Duane, his wife Angela, and daughter Lauren live here in Templeton. Rick has worked with several GM dealerships starting in 1979. In 2000 he left GM, after helping Duane part time for a number of years, and came on board full time. 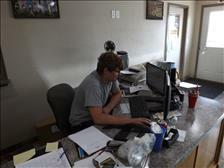 Rick does most of the scheduling, invoicing, the vehicle purchasing and sales. 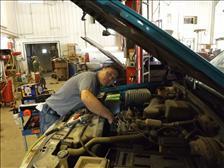 Rick specializes in helping the customer find and purchase the right vehicle for their needs. Rick has been purchasing all the vehicles on line through several sources since 2007. He has also found that the off lease market is the place to purchase better quality used cars, as they normally have a better service maintainance history. He then hopes to trade for the nice older cars for resale. Cars that he does not trust get taken to auction. 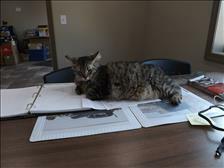 Penny was added to the staff March 1, 2012. She does very well with meeting and greeting the customers. Some of customers even feel it necessary to bring her treats, which she has quickly learned to be their best friends. At night when the doors lock and the lights turn off she becomes a security guard, and does very well with that also. Cory started with Duane's in August of 2016. Cory graduated from Wyoming Technical Institute in 2009. He worked for Deery Brothers Chevrolet after graduation till 2016. he bring much knowledge of the General Motors product line with him. Cory and his wife Emily live right here in Templeton and are parents of a new baby boy born August of 2017. Dalton graduated from University of Northwestern Ohio in June of 2016, where he studied automotive technology. He working the Service Manager/ Writer position here at Duane's. He can be reached at 712.669.3608. Dalton lives here in Templeton.